Some of you reported difficulties using the automatic post to insert Alhabib islamic widgets in your blogs. Some got error messages, while the others reported failed notes. Still some others experienced other types of difficulties so that they cannot put the widgets automatically into their blogs. So, there are many ways to Rome. 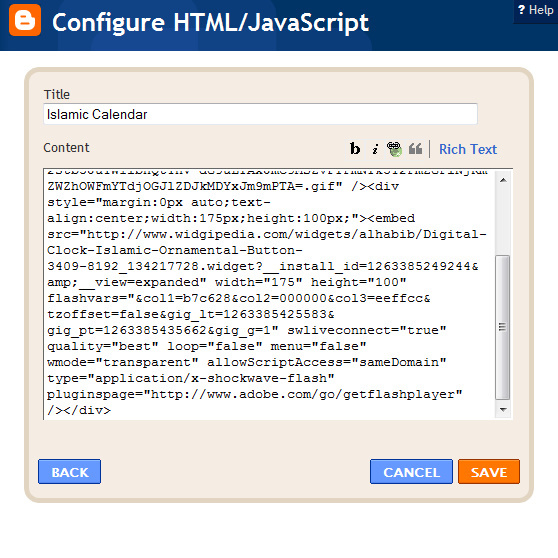 In this tutorial, you will learn, step-by-step, how to display or insert the islamic widgets on your Blogspot blogs, manually. 1. Copy the embed code for a particular islamic widget. This code is available after you click the BLOG ME button on every widget configuration page. You can copy the embed code by clicking the text box or the COPY button. 2. Enter your Blogspot’s Dashboard. 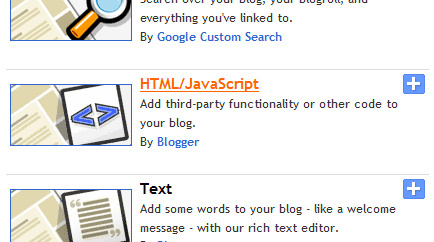 Visit www.blogger.com and enter your Dashboard by providing your Google account’s email and password. If everything is okay, you will be presented with a list of blogs that you can manage. 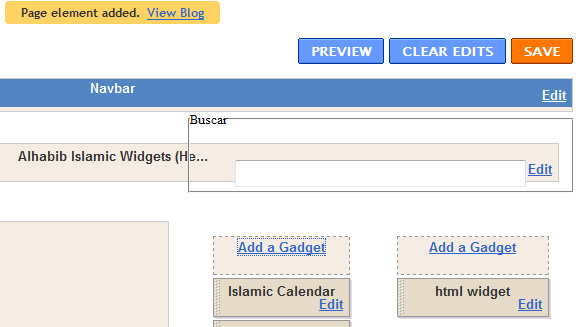 Click the LAYOUT button on the blog list that you want to insert the islamic widget into. A diagram of your blog’s layout with its elements will be displayed. 3. Add a new Gadget. 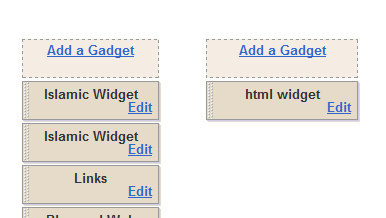 Look for an ADD GADGET button on your blog’s layout diagram. Depending on your theme, such button can be anywhere and more than one. Choose the one on which position you want to show the islamic widget. 4. Insert the code in the Configuration Box. 5. Save the changes to your blog’s layout. You will be directed back to the layout page of your blog and a message will tell you that a new element has been added. The newly added gadget will be represented by the title that you have given in the previous step. On the top row, you have the choice to PREVIEW your changes. If you are satisfied, do not forget to SAVE the modified layout. Ok, that is all the steps that you need to take to manually inserting the islamic widget on your blogspot blog. I hope I am clear enough in explaining. Please offer an option to use a widget with no ads. Currently a static ad shows whenever our webpage is opened, in the place of the calendar. User will need to refresh the page in order to get to the calendar. Just to say…May you be blessed for sharing and teaching brother. Hope its ok..I have also pinned some of your quotes onto pinterest. Tq again. The blogger interface in google is a very user-friendly. Even if you are a newbie on this interface, you can easily maneuver on all the things that you want and need to post in your own blog account on blogger.com . Whoah this blog is magnificent i like reading your posts. Stay up the good paintings! You know, a lot of people are looking round for this information, you can help them greatly. Loving a post could be like giving an optimistic opt for change, I can like every post I like, but no loves could be wasted from me if I provide a good one to your website. I say to you right now, this has a good like from me. Thanks, this can help me in the future for my sites! Thank you for your article and widget. It is very clear tutorial and easy to follow. I have copied it into my blog. Could you share many more Islamic widget for blogspot? Helpful post. The instructions are very well laid out. This is very inspiring for Islams out there and I'm pretty sure that lots are already encourage to o do this one. God job! Extra people have to learn this and perceive this aspect of the story. I am pretty you can just click the BLOG ME button on the widget configuration page. Hope that helps. Nice one..! 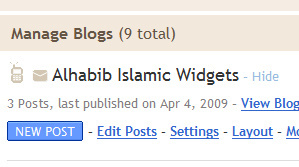 I like the way you guided and its really nice to add islamic widgets to our blogs..Thanks for sharing. Jazakallah…. will try to apply your tutorial, its quite clear.. wish me luck, it will make my blog look beautiful..
where are the embed code?? Can I just say what a aid to search out someone who actually is aware of what theyre talking about on the internet. You undoubtedly know learn how to convey an issue to light and make it important. Extra people have to learn this and perceive this aspect of the story. I cant believe youre no more standard since you undoubtedly have the gift. UNBELEIVABLE ! they sell PlayStation gor USD39.99 – I’m not sure why the price is sooo low but it’s real.Head to this blog http://playstation3usd40.blogspot.com/ and see your self….the original price was USD499. Thanks pal. Good submissions you have here. Got some more websites to point to which have a bit more stuff like this? It looks like a very useful gadget for many people! Just think, in three years there will be handheld devices outperforming today's laptops and netbooks. Pretty amazing how fast things are developing these days. Thank you for great article but doesn't work for me,if give you my url,can you check for me ? Thank you so much for all things.. 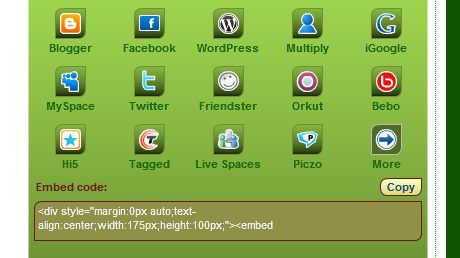 If you talk about the self-hosted wordpress, then I think you can put any HTML code on your TEXT widget? Have to say – thank you so much for this blog!! coba langsung di masukin htmlx sekalian!! I am fine … 🙂 I was just surfing internet in regard to Islamic gadgets .. i have seen your blog .. And from there I got an idea to make my own website and made a show room of Islamic gadgets.